Could Google be prepping a bigger mobile gaming push? Why does Google need a "Chief Game Designer"? The LinkedIn profile for a veteran computer games designer has popped up on a radar wider than his circle of contacts, leading to speculation the search giant may be getting serious about mobile gaming. 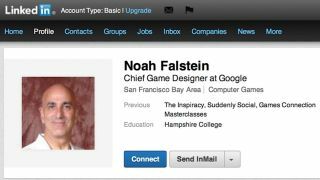 TechCrunch reported Thursday that Google appears to have quietly filled a new position for "Chief Game Designer," with longtime computer game designer Noah Falstein tapped for the job in April. The discovery was made from a change to Falstein's current job description on professional-focused social network LinkedIn, where Google is now listed as his current employer. Falstein's former employers include legendary game companies LucasArts, Dreamworks Interactive and 3DO, with his last position listed as freelancer for his own shingle, The Inspiracy. While the LinkedIn profile is scant on details of exactly what the designer may be doing at Google, an earlier cached draft of his new job title could provide a clue. Falstein originally listed himself as "Chief Game Designer at Android Play Studio," a rather specific title that would appear to put the designer in very close proximity to Google's mobile OS. While the report speculated Falstein could be involved in designing "Google Glass-related augmented-reality game" titles, the executive's main field of interest - "Serious Games" - may indicate otherwise. Described as "using Games, Game Technology, or Game Industry Techniques for a purpose other than pure entertainment," Falstein's work spans health, financial projections and even education - all of which sound rather lofty for a so-called "Android Play Studio" hire.